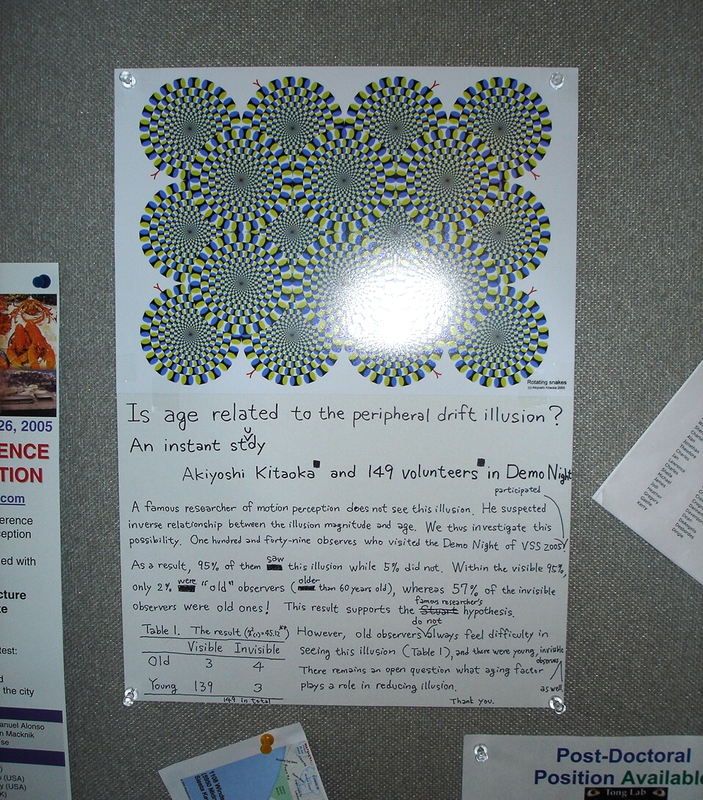 Data from high school students (with one teacher) (October 4, 2007). For scores, see text. 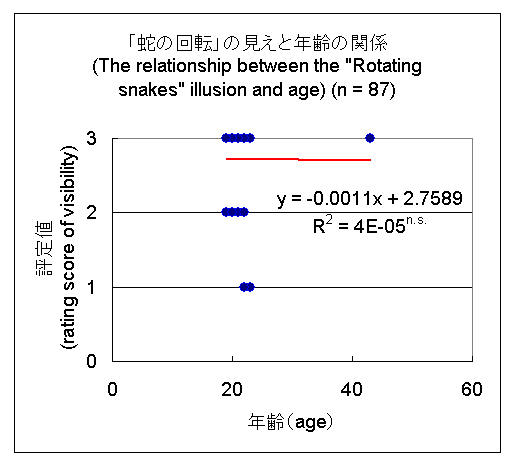 Data from Ritsumeikan University students (October 12, 2007). The graph shown below displays the combined data that have been collected so far. 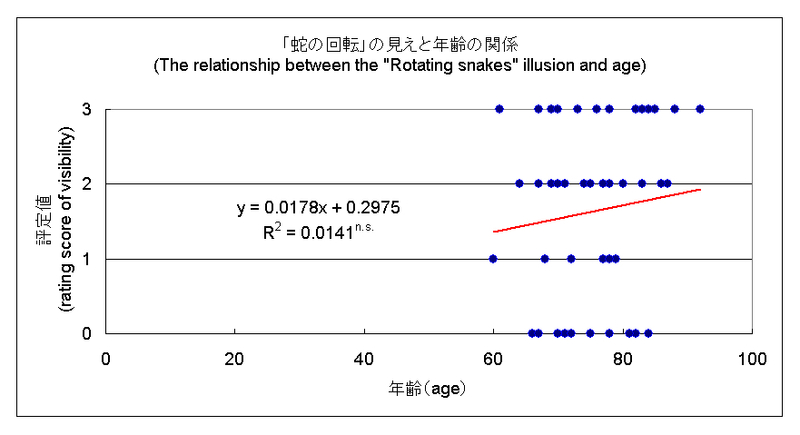 A strong negative correlation (r = -.46) was found between the Rotating Snakes illusion and age! 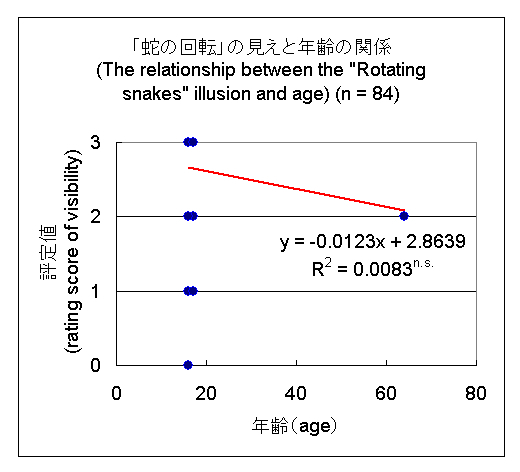 This does not necessarily mean that the older the observer is, the less visible the illusion. 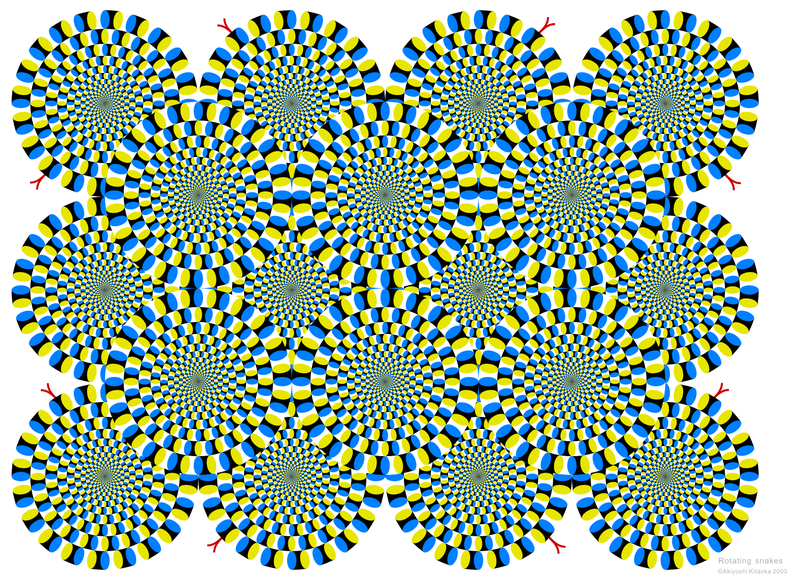 This indicates that some unknown characteristics of this illusion are related to age while this illusion is not related to aging. 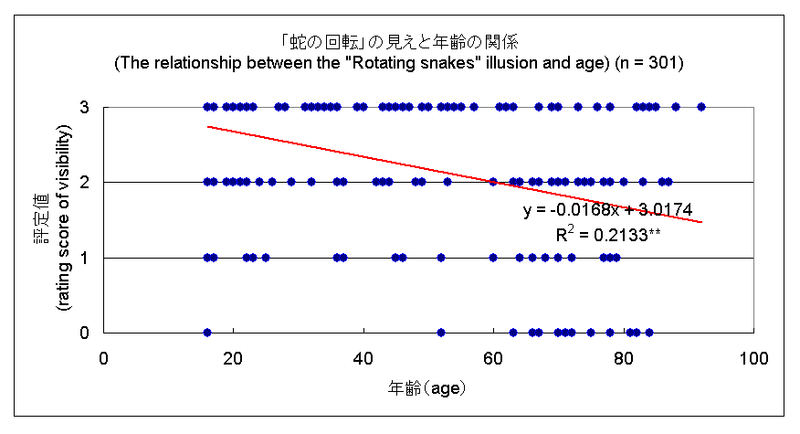 The relationship between the "Rotating snakes" illusion and age has been suspected. Several researchers including me made preliminary surveys, showing positive or negative data. 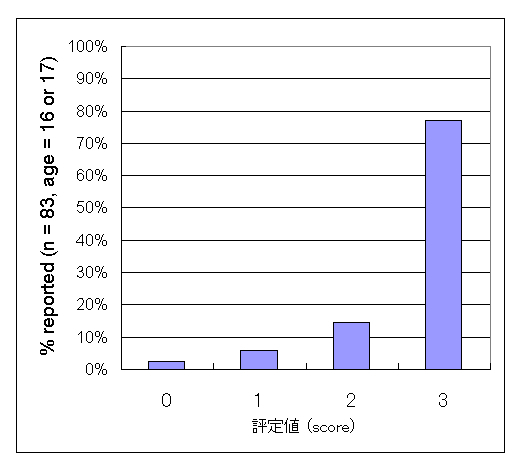 These surveys actually failed to inlude enough number of old people's data.Here I report the result from 56 old observers (more than 60 years old), who attended my lecture held on 20th September, 2007 in the hall for retired people of Amagasaki city, Hyogo-ken, Japan (next to Osaka city). 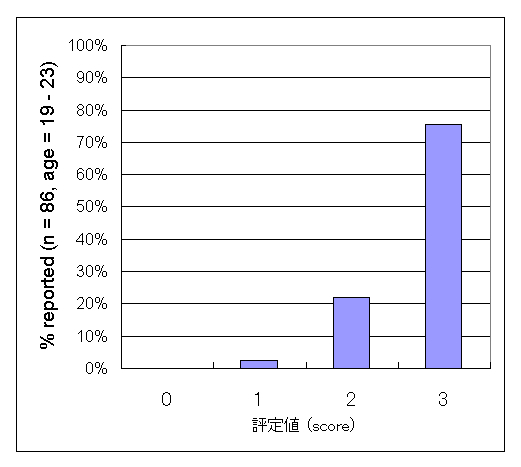 Fifty-six citizens participated, the age ranging between 60 and 88. 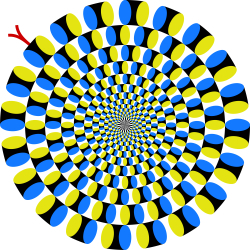 The items for answer were "Rotating snakes appear to move well" (score 3), "Rotating snakes appear to move" (score 2), "Rotating snakes appear to move slightly" (score 1), and "Rotating snakes do not appear to move at all" (score 0). If this set of data is combined with a previous one, the total distrubution from young to old is interesting as shown below. 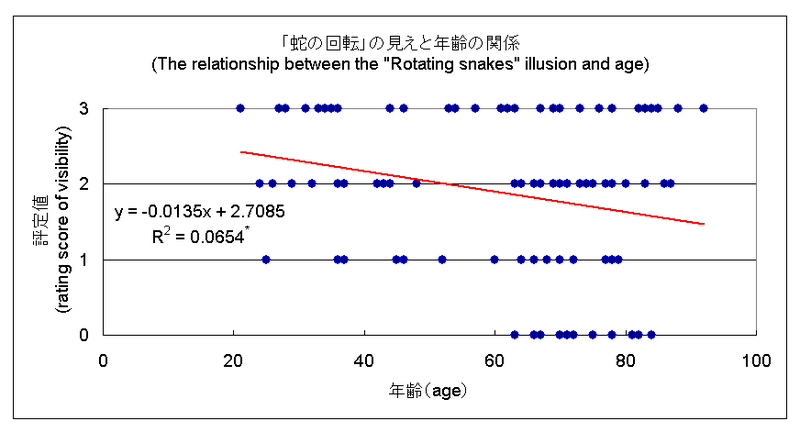 People with no illusion increase after the point of the 60 years old. 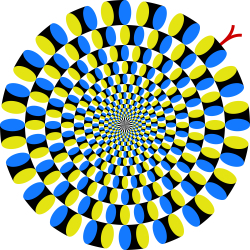 But many people see illusion even if they get still older.